During a week eight slate with two standout match-ups, a pair of running-backs stole the show in College Station and South Bend. Saquon Barkley is the clear front-runner in the Heisman race right now and after shredding the previously stout Michigan defence for over 200 all-purpose yards and three scores he continues to be the shining light in Penn State's unbeaten season. 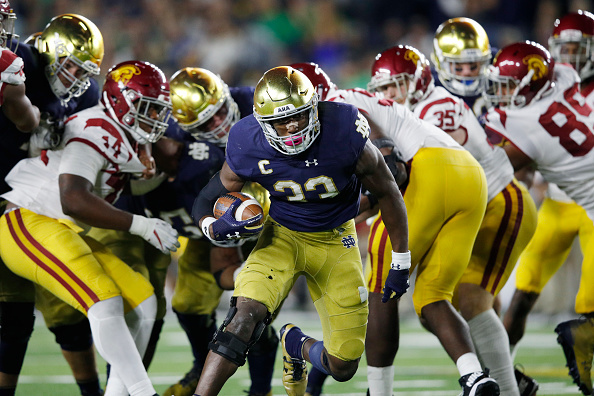 Stanford's Bryce Love had the week off and remains Barkley's biggest threat, but a new name will enter top five lists this week in Notre Dame's Josh Adams. In what looked like an elimination game for the College Football Playoff, Notre Dame won in all three facets of the game during a 49-14 victory in Indiana. Quarterback Brandon Wimbush played his best all-round game of the season, throwing a pair of beautiful first quarter touchdowns during the win. However it was Adams who was the main factor in Notre Dame putting up 49 points, with the junior running-back accounting for three scores and averaging over ten yards from his 19 carries. Adams now has single-game rushing totals of 161, 229, 159, 118 and 191 in five of his seven tilt's so far this season and currently sits just 33 yards short of a 1,000 yard season already. His breakaway speed and big-play ability make him similar to Barkley and Love, and with a heavy back-loaded schedule which still includes games against Stanford, Miami and next week NC State, Adams will have plenty of chances to add to his growing reputation. TCU's shutout of Kansas leaves them as the only unbeaten team in the Big 12, but the Oklahoma school's remain waiting in the wings for a Horned Frog slip-up after coming through tight affairs in week 8. Oklahoma State relied on overtime to see of a Texas Longhorns unit who just can't get over the line in tight games. Later in the evening, the Oklahoma Sooners overturned a double-digit deficit to defeat Kansas State 42-35 in Manhattan, with Baker Mayfield accounting for four touchdown's in the victory.